The arms race to streamline the restaurant dining experience is on. MenuPad, Hubworks Interactive, E la Carte and a number of other startups offer digital menu and payment products that aim to boost restaurant check averages, limit wait times and improve overall customer service. Critics argue, however, that these technologies dehumanize their dining experience. 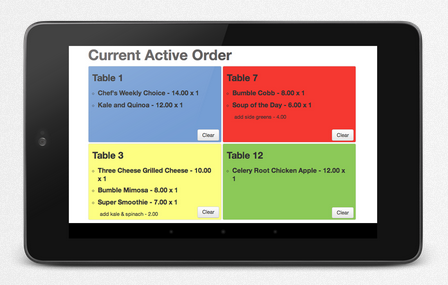 Now Sam Brin, the 26-year old younger brother of Google co-founder Sergey Brin, and his college buddy Jon Li, are aiming to tackle this issue with Butter Systems, a fully-customizable, table-side ordering platform, Android-based of course. Unlike its competitors, Butter, a member of the Y-Combinator’s 2013 class, is replacing menus with tablets, not people with technology. The system augments the traditional dining experience by enabling customers to order on their own time, so they don’t have to worry about flagging down a busy server when their craving for that second order of onion rings hits, for example. “We want to increase sales by making it easier to order more, all while keeping that human touch,”Brin tells TechCrunch. The restaurant staff monitors all incoming orders through a back of house counterpart app before green-lighting them to the kitchen. When diners are finished they tap the “Check Please!” button, which alerts their server that they are ready to pay. Payment happens the old fashioned way, at least for now, sprinkling human interaction into the final moments of the meal. Butter is currently beta-testing the tablet at Bumble in Los Altos, CA and plans to expand to other restaurants in the next few weeks. For now they are offering 30-day free trials and are uncertain of what they will charge in the future–most likely a one-time set up fee, a monthly subscription or a combination of the two, reports TechCrunch. Next, Butter plans to focus on building out their analytics capabilities so its users can make harness their customer preference data to influence marketing campaigns and increase sales. Collecting data on the perfect menu spot for seasonal cocktails, the ideal cheese burger description, and weather that image of a family devouring a plate of nachos if heart-warming or off-putting. Having the ability to test data-driven changes, without calling up the printer and dropping a few thousand bucks on redesigned menus, could help restaurants revamp their marketing in real-time and drive up sales. Changing customer perception of these tablets is difficult. In 2012, only 20 percent of customers wanted to pay for their meals using an iPad or tablet, according to Erik Thoresen of Technomic. Customers worry that tablets will take over traditional dining and dehumanize the social ritual of eating out. Utilizing data-driven analytics to personalize the dining experience in real-time without compromising the human touch could help change customer perception. 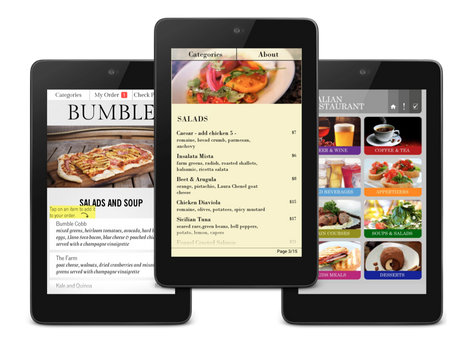 “The success of tablets in eateries depends on customer adoption and their value proposition,” says Thoresen. How do you feel about a tablet take-over? Is it the future of dining? Let us know in the comments section below.